This four-year programme provides an additional year on top of the Earth Sciences BSc, in which you undertake an independent research project, extend your knowledge with advanced modules related to your specialist pathway, and join in a wide-ranging seminar series on Earth and Planetary System Science. The programme includes up to approximately three months of field classes in the UK and continental Europe, with financial support from the department. The holistic nature of the Earth sciences is emphasised. The opportunity to specialise within Earth sciences and, by the appropriate choice of modules, graduate with a degree in Earth Sciences (Palaeobiology) or Earth Sciences (Environment and Policy) is available. World-leading research in mineral, ice and rock physics, geophysical hazards and palaeoenvironmental analysis is undertaken in the department and is used in the development of our modules. World-class facilities include hosting the UK's only NASA Regional Planetary Image Facility, use of the UCL University of London Observatory, and collaboration with the Natural History Museum. On entry to the programme, you will select a pathway through the subject (General, Palaeobiology, or Environment and Policy). 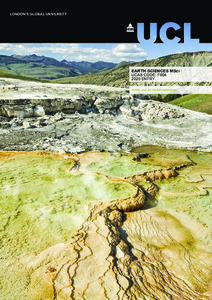 The programme includes many optional modules across UCL Earth Sciences. Students should normally take at least five half-module credits in UCL Earth Sciences each year. Modules based in other departments may be chosen from those listed for the Environmental Geoscience, Geology and Geophysics degree programmes and the Palaeobiology or Environment and Policy pathways. The first and second years provide core skills and knowledge in the subject. The third year provides opportunities for specialisation and diversification, with an emphasis on individual initiative and problem-based learning. Fieldwork provides a unique opportunity to develop independent and team skills and problem-solving abilities. The first three years of the MSci programme are identical to the BSc programme. However, the additional fourth year of the MSci allows for an individual research project and advanced optional modules, providing extra depth and breadth of knowledge. All third-year modules are optional. Please note: the modules listed above relate to the General pathway for Earth Sciences. For specialist pathways, please see the department website. Detailed course descriptions are available on the department website: Earth Sciences MSci. We normally reach a decision on making an offer on the basis of the application alone. If you are resident in the UK and have been made an offer you will be invited to an applicant open day. This visit will include introductory talks on UCL Earth Sciences and our degree programmes, a tour of the department and UCL and a question and answer session.